Gym equipment is not always required for losing underarm fat. Cardiovascular and resistance exercises in combination with daily calorie intake are way better in burning excess body fat on the body, including underarm fat. No one can target underarm fat with diet and fitness, but burning overall body fat is possible. The next 5 steps will help in achieving your goal, burning your excess underarm fat. Limiting daily calorie intake is a king. Eliminate processed and junk food and always try to stick yourself to a single portions of whole foods from plant sources like: whole wheat, barley, fresh produce, legumes, oats, quinoa, wheat berries, nuts and heart-healthy fats such as olive oil, seeds and avocados. Cutting only 500 calories from our daily diet, may result in losing 1 pound per week. 1 hour exercising per day, every day. This will result in 500+ calories burned combining various workouts like kickboxing, martial arts, swimming laps, high-impact dance, running, jogging, speed-walking, climbing hills or stairs etc. This single step may result in 500 calories cut off weekly. Combined with Step 1, you may lose even 2 pounds weekly. Tone your arms, back and chest muscles with resistance exercises. Doing this kind of workout, will result in trimming fat, while defining and toning your muscle. You will start seeing the results quickly! Well known upper body no-gym workouts are: triceps dips, pullups, pushups and yoga. Stay away from packaged smoothies and juices that contain sugar and syrup, soda, energy drinks and all kinds of coffee beverages. Even though they provide rich nutritional value, they are not healthy at all. Remember, the best way to hydrate your body is plain water. Add muscle-building workouts to your exercise regime. Using your own weight exercises, are way better and much useful than gym workouts. Workouts to be considered are power yoga, circuit training and boot camp, but also jumping jacks, lunges, deep squats, planks, triceps dips and abdominal crunches. This way you will boost your metabolism and you will start to burn calories and body fat even when you rest. 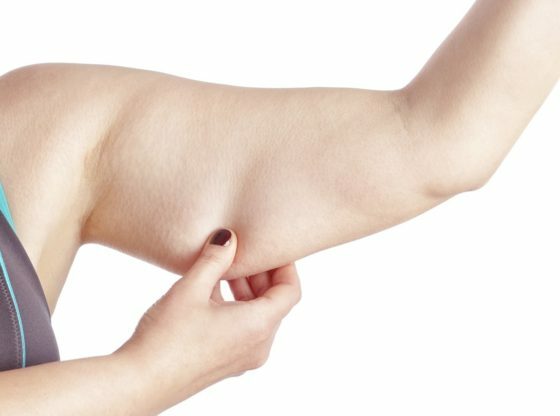 Burning underarm fat is all but easy. However, sticking up to these 5 steps will improve your health and boost burning under arm fat as hell. Don’t forget to share this on Facebook, Pinterest and StumbleUpon.